Named for the county in New York where the company was located, Steuben Glass Works is widely recognized for producing a plethora of fine art glass in the early 1900s. The firm took shape in 1903 when Thomas Hawkes, president of T.G. Hawkes and Company, and Frederick Carder joined together in Corning, New York. This new firm would change the entire glassmaking industry, and etch Frederick Carder’s name forever in the annals of gifted glass masters. Steuben produced many blanks decorated by Hawkes' firm until 1918 when it became part of Corning Glass Company, as well as making decorative and colored glass in Art Nouveau styles. Some of Steuben's lines were completely innovative and others competed with iridescent wares made by Louis Comfort Tiffany and the Austrian glass company Loetz. 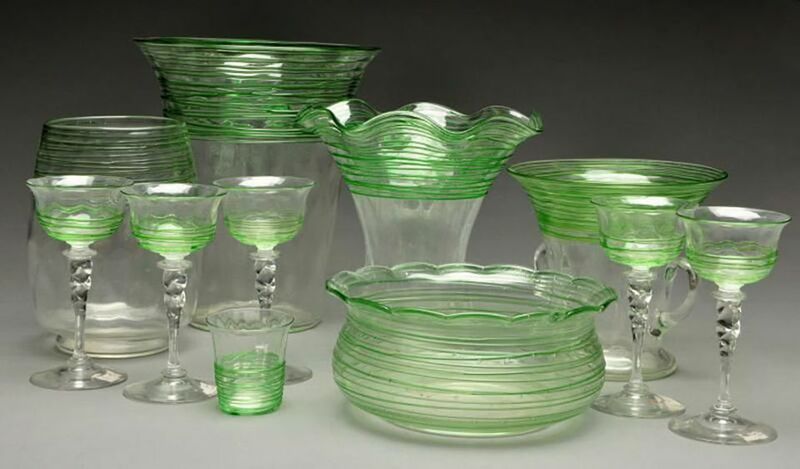 Tiffany sued Steuben after seeing Aurene pieces believing his Favrile glass was being copied. When it came right down to it, the process of making the two was different, so the suit never made it to court. Historians haven't really determined which of these companies inspired whom, according to art glass expert Arlie Sulka in an Antiques Roadshow online feature, but there’s no doubt they were all competing for the pool of art glass customers back in their day. It's clear that Carder was the mastermind behind the production of Steuben's more revered work. His background included studying with French glass master Emile Gallé and designing for the English firm of Stevens and Williams prior to migrating to the United States. He served as Steuben’s art director through 1933 when he retired. During his tenure, he contributed to the development of some of the firm’s most adored colors and surface décor techniques. Steuben clearly would not have thrived as it did without Carder's hand in the business. Even after his retirement, he continued to experiment with glass production using the lost wax process in his studio office through 1959 creating a number of rare and desirable pieces of art glass. Carder died in Corning, New York in 1963 after a long and influential career in the glass crafting industry. Most Steuben glass was marked in some way before leaving the factory, even if it was only a paper label affixed to the glass. These paper labels can be round, triangular, or octagonal in shape when found intact. There will usually be a polished pontil present (an indicator of blown glass) even if the paper label has worn or washed away over time. Aurene pieces are also engraved with either "AURENE" or "STEUBEN AURENE" with a rather amateurish look to it. "F. Carder" is also found engraved on some rare pieces and on items that were brought to him for identification from about 1903 to 1932, according to Shuman. Pieces in the Intarsia pattern, Carder’s personal favorite dating to 1930, will have an engraved signature reading "Fred'k Carder" along the bottom rims. Diatreta pieces Carder made personally in limited numbers from 1945 to 1959 (after he retired from Steuben) were marked "F. Carder" using abrasive wheels on flexible shafts, and some are dated as well. Steuben began and discontinued lines frequently to satisfy the whims of consumers, so some were in production for a very short time. Some of the many documented colors, styles and decorating techniques employed by Steuben include beautifully iridescent Aurene glass which was made in gold, blue, brown, red and green; Bubbly, which is actually filled with tiny bubbles; Threading and ​Reeding; and Verre de Soie.